GOIZPER will participate in the coming international EuroBLECH fair that will take place in Hannover between 21 and 25 October. Stand D12, Hall 27. Goizper will offer different applications for the machinery sector, related to the world of metal forming. Since the start of its activity, Goizper has worked very closely with manufacturers of presses, metal cutters, etc. to provide optimal solutions according to the market needs. 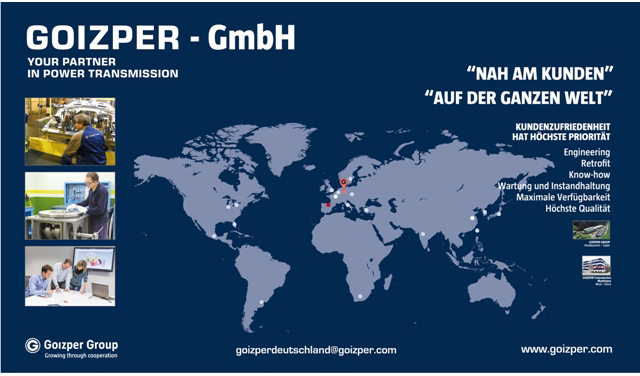 Now with the implementation of the Goizper GmbH offices, our position on the German market and in Central Europe is strengthened. At this fair, Goizper will place emphasis on products such as safety brakes that are installed in servo presses and on complete transmission systems, comprised of a planetary gear unit, flywheel and brakes-clutches (pneumatic or hydraulic). This solution provides a compact and reduced transmission, and can offer a more flexible speed range than normal solutions. Likewise, after the incorporation of GUIBE S.A. into the GOIZPER cooperative group, they will be presented on the international market, where Guibe is one of the best positioned companies in the market of planetary gear units, gearings, mechanical jacks, couplings, etc. for very diverse sectors: steel industry, mining, food, paper, wood, plastic, renewable energies, transport, etc. With this acquisition, Goizper complements the personalised offer of differential and global solutions of Power Transmission components. We invite you to visit our stand D12 and discover the novelties first hand. Its more than 50 years’ experience in the market, together with the technological adaptation and innovation capacity of its products, has meant that Goizper is a key partner in industrial transmission projects.